Microsoft Access is the relational database management system from Microsoft targeted for small to medium sized businesses. It combines integrated tables, queries, forms, macros and reports for an all in one solution to many business data problems. 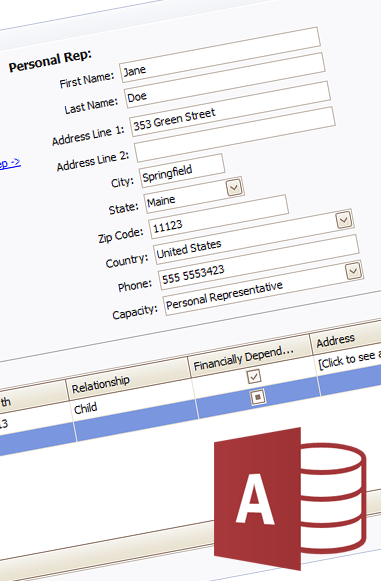 Microsoft Access is the starter database platform for countless businesses around the world. Businesses often start out with small Access solutions which grow over time, frequently changing to meet their needs. Contact us for a quote or advice on any of your Access related issues. We offer everything from total overhaul of existing systems to design of new Access applications to simple querys, macros or just some advice. We specialize in improving the speed of your Access system making it respond faster to your business needs. Many businesses quickly outgrow their Access software and demand more and more capabilities. Upgrading to SQL Server brings huge improvements in performance and capabilities of your database system while often still maintaining the same Access forms and queries. We offer a variety of solutions to deliver your existing Access database system to mutliple offices when your business expands. Contact us for more information.